I'm often asked if I get bored screening so many different titles and while, occasionally this happens as there's no worse feeling than getting one episode into a television box set or ten minutes into a movie and realizing it'll be an extremely long experience, overall I subscribe to the adage that I can learn something new everyday. Consider Nickelodeon: before SpongeBob SquarePants came along, I would never have imagined that an animated sponge who lives in a pineapple under the sea would be that funny. And boy did I kick myself after watching True Jackson, VP. Had it ever occurred to me that I could "get discovered" that way, I'm thinking I really should've set up lemonade stands in the lobbies of publishing houses, The New York Times, and just outside the gates of my favorite movie studios. Alas, no, silly me-- limited by geography and reality-- by the age of eleven I began sending out my query letters, screenplays and manuscripts and kept the lemonade stand separate. Yet, I employed the same discipline with the stand as friends and I used strategic locations to maximize the potential of new neighbors moving in and construction workers putting in long hours by offering Crystal Light and Kool-Aid for a dime (or if we were feeling extra ambitious) a whole quarter. However, fifteen year old True Jackson, played by likable Akeelah and the Bee star Keke Palmer was not only braver than a suburbanite for heading right into the fashion district but she brought along sandwiches as well obviously forgetting the lesson in Devil Wears Prada that you're not supposed to eat... much. Fond of taking designer clothing and tailoring it to fit her own style with different color buttons or a new hem, after a five minute encounter with boss and CEO of the brand of clothing True happens to be wearing, Max Madigan (Greg Proops) sees her potential and hires her as the newest Vice President in charge of Youth Apparel for his company MadStyle. Luckily hopscotching right past design school, internships, and Project Runway, True Jackson skips directly past go and finds herself pulling an Ugly Betty except Palmer is adorable, down-to-Earth and not based on a telenovela. Yet, diversity and girl power rules the day as originally True aired in its world premiere following iCarly's first TV movie, iCarly Goes to Japan and reached record numbers of viewers with its initial few episodes. 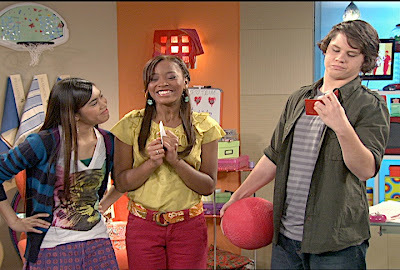 Luckily Nickelodeon has always been thankfully more diverse than most other rival tween and teen networks and essentially it uses the same model as iCarly in presenting us with a friendly, intelligent main character and her female and male best friends, this time all of different races and with a unique flip in personalities. While Miranda Cosgrove's iCarly costar Jeannette McCurdy appears in a cameo performance on True, instead of providing Palmer's True with a sidekick like McCurdy's aggressive bully Sam, True's BFF is the fun-loving but flighty and easily distracted Lulu (Ashley Argota) who has the world's shortest attention span. Essentially if Twitter were a person and all of the tweets of numerous users were embodied by an individual, it'd be Lulu who loses focus faster than she text-messages which wouldn't normally be a problem aside from the fact that True hires her to be her secretary and soon realizes she's doing double the work. The third amigo Ryan (Matt Shively) isn't an employee of MadStyle but he might as well be. Ryan basically spends his entire summer vacation in and around True's office as though he were a painting someone has never moved, that is until he enlists Lulu's help to attract a girl he likes and later when his gal pals try to boost his self-esteem by talking him up at a skate park. Quickly discovering that life in offices, meetings, and/or cubicles is as cliquish and gossip prone as high school, True clashes with the office's sycophantic Queen Bee, the amusingly named Amanda Cantwell who is determined to bring down the bubbly teenager who skipped all of the hard work, networking, and education to find herself given a beautiful office on the strength of a few stitches and a sandwich. Despite the dubious set-up and the fact that we never actually get a good sense of True's flair as a designer since most plots involve the central cast's interpersonal issues with barely any mention or scenes involving the work that True constantly alludes to throughout the series, the ensemble volleys well back and forth to keep us distracted enough not to notice all of the gaps in logic or questions about what's going to happen when school comes back around etc. 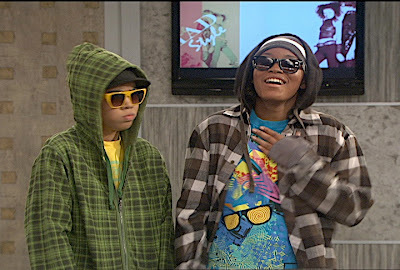 With very weak humor and the obvious audio "assist" of the live studio audience nurturing it on by laughing uproariously at the most minimal of jokes and a struggle to balance the adult plots with those of the kids in a way that engages either demographic fully or authentically, it'll be an uphill climb for True Jackson, VP to reach the natural flow of iCarly. Although it makes an interesting companion show to Carly, from an audience standpoint and lackluster pilot aside, that program succeeded right off the bat with a cast and writing staff that was all on the same page and by ensuring that the Carly kids still act like kids while in grown-up environments. 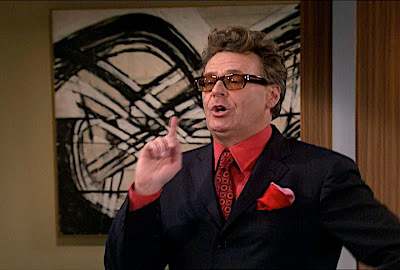 While the kids are still kids on True Jackson, it's much tougher to buy into the shenanigans that occur at MadStyle because the two pieces of teen wackiness and important business meetings just don't fit very well together without making the adults look irresponsible or more immature than True (which the writers do most of the time). While of course, this could be remedied if True, Lulu and Ryan tbecame miniature versions of Tim Gunn, this would lose the kid vote immediately. As someone with a personal interest regarding child prodigies who-- as the daughter and cousin of former models-- also loves fashion, I was very hopeful that True Jackson, VP would be a creative success. And despite a few entertaining episodes, overall I couldn't help wishing I could set up a lemonade (or sandwich stand) outside the Nickelodeon gate and try to rework it in the writer's room along with the talented cast and crew. Moreover, I want it to succeed as its own series and not "iCarly Goes Vogue," "Project Nickelodeon," or "Ugly Betty Gets Slimed" since the potential is there but the setup and payoff just don't "rock the show," to combine fashion talk with TV critique. Filled with mini behind-the-scenes plugs and cast lead-ins to episodes that no doubt aired to remind Nick viewers about the new series in its first year for these 13 episodes, the best extra by far involves Runway's Heidi Klum herself as we're given a five minute overview of the coveted Barbie Fashion Show during New York's Valentine's Day 2009 Fashion Week.